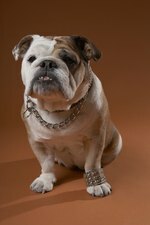 English bulldogs are wonderful pets that delightfully entertain with their unique features and funny antics. Like many other breeds, English bulldogs love to eat and will try to convince you they are hungry even when they are not, so be on guard. Additionally, their unique facial structure, large-sized heads and sensitive skin folds and wrinkles can make everyday tasks, including eating, a chore. This should cause you to take extra care when choosing the dishes that hold their food and water. Do not choose a bowl for your English Bulldog based on how cute it looks. Ceramic and plastic bowls tend to have adorable designs painted on them that make them appealing to buy. Unfortunately, these types of bowls can become breeding grounds for all sorts of bacteria that can quickly transfer to your bully's skin folds and wrinkles. Stainless steel food bowls are a far better choice. Make sure the bowl you purchase is big enough. Sure your puppy is only six months old, but already his head is the size of many full-grown adult dogs. Bulldogs are known for breathing difficulties, so a bowl that is too small will only make it all the more difficult for them to breath easily while inhaling their food. Ask your vet for a recommendation based on the size of your dog or bring your bully to the store with you and choose a bowl that is large enough for him. Raise those bowls. Having a stand to elevate your bully's food and water dishes is a great way to reduce strain on her neck and spinal cord while she eats. This may make breathing while she eats easier as well. You would not like to bend down to eat your food, so chances are your bulldog is not crazy about it either. Wash your English bulldog's food and water dishes regularly. The great thing about stainless-steel dishes is that they are dishwasher safe. Start the habit of washing your bully's bowls as soon as he is done eating. This way food will not be stuck to the bowl and it will come clean easily. Make sure to thoroughly rinse the dishes if you decided to hand-wash them so your bulldog does not get an upset stomach from eating soap. Regular washing daily and in between meals will reduce the chances of bacteria and dirt building up in the bowls.